"Shake-speare" was a strong proponent of romantic love and argued passionately for it to displace the practices of arranged marriages and women as chattal. 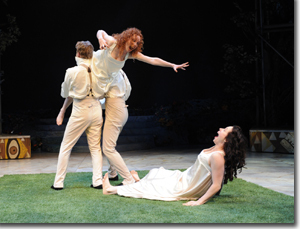 To ignore love as a force of nature, he opined, was to invite tragedy (Romeo and Juliet), or to be made a fool of, as we see in this marvelous production of A Midsummer-Night's Dream now running on the Denver Center Theatre Company's main stage. Three incredibly different social groups—Athenian nobility, spirits and faeries, and working-class stiffs—each wrestle with the challenges of love, property, and sexuality: and, in comedic fashion, all come out for the better. DCTC artistic director Kent Thompson chooses a classical Greek-columned setting, against an azure and gold-tinged landscape, replete with reflecting pool, that references Maxville Parrish. John Iacovelli's design dissolves easily into a sylvan backdrop, where the playwright's newly minted genre of Arcadian devas unfolds. Hermia (Caitlin Wise) wants to marry Lysander (Leigh Nichols Miller), but her father, Egeus (Philip Pleasants), wants her to marry Demetrius (Drew Cortese). Theseus (Keith Hamilton Cobb), the Duke of Athens, is importuned to reconcile the conflict. Hermia's best friend, Helena (Allison Pistorious), is hot for Demetrius, but he will have none of it. An elopement sends the young lovers into the woods, where they enter a kingdom of spirits ruled by Oberon, King of the Faeries (John Hutton), who is at odds with his Queen, Titania (Kathleen McCall), over Indian Boy (Gabe Simmons), a changeling. 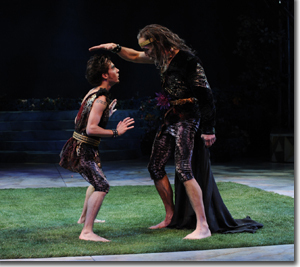 Puck (Michael Wartella), a sprite, helps Oberon reconcile both the Athenian and faerie issues, with the aid of a rare flower pollen and some old-fashioned magic. The overt sexuality of the young lovers careening across the stage heightens the sensuality of this already intoxicating story, pushing it to new heights, and creating an intriguing contrast with the more complex emotional issues between the middle-aged Oberon and Titania. Yet in both cases, the magical catalyst is the same—memory wiped clean by a special herb. The same potion plays a role in the third plot as well, which depicts an amateur acting company comprised of six laborers—Quince, a carpenter (Sam Gregory), Snug, a joiner (Stephen Weitz), Bottom, a weaver (Lawrence Hecht), Flute, a bellows-mender (Chad Callaghan), Snout, a tinker (Tom Coiner), and Starveling, a tailor (Randy Moore). Like the players in Hamlet, the rude mechanicals of A Midsummer-Night's Dream provide a marvelous opportunity for the playwright to explore the art of acting while commenting on class distinctions. 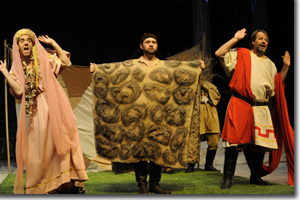 In addition to their pure entertainment value, the well-tempered performances of these rustics reveal the tremendous depth of talent that our regional theatre company brings to bear to meet the demands of the epic staging required by "Shake-speare." Hecht's Bottom, a good-natured bumpkin with pretentions, sets a jovial and charmingly clueless tone for this ragged band of caricatures. The nobility laugh at their antics, failing to see themselves in the rustic's crude charade. 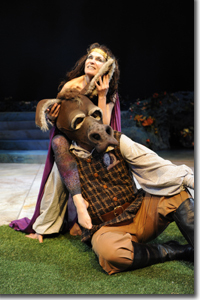 The Denver Center Theatre Company's production of A Midsummer-Night's Dream runs through February 26th. 303-893-4100.